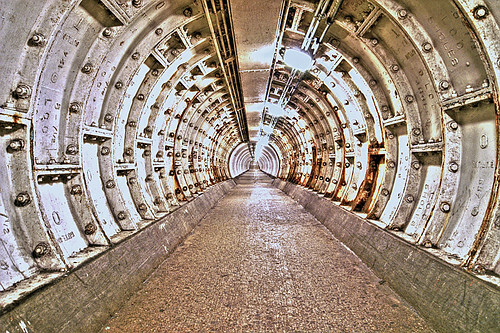 Inside the Greenwich foot tunnel: great for (walking) London cyclists. Photo by nick.garrod on Flickr. We show that some customers, whom we call ‘Harbingers’ of failure, systematically purchase new products that flop. Their early adoption of a new product is a strong signal that a product will fail – the more they buy, the less likely the product will succeed. Firms can identify these customers either through past purchases of new products that failed, or through past purchases of existing products that few other customers purchase. We discuss how these insights can be readily incorporated into the new product development process. Our findings challenge the conventional wisdom that positive customer feedback is always a signal of future success. The authors aren’t specific, but might another word for such people be “Kickstarter participants”? Flash files can not only be embeded in a web page but also in various document formats such as Microsoft Office documents and PDF files. Even if you have disabled Flash in your browsers, Flash exploits can still leverage Flash player vulnerabilities through software like Microsoft Office and Adobe Reader. Let’s do some tests. I will use the PoC of CVE-2015-5122 from the Hacking Team in my test. It will pop up the caculator program when loaded in browsers and other applications that have a vulnerable Flash plugin enabled. Oh god, please can Flash DIAF? This study [from 2011] also confirms our earlier finding that trade statistics can mislead as much as inform. Earlier we found that for every $299 iPod sold in the U.S., the U.S. trade deficit with China increased by about $150. For the iPhone and the iPad, the increase is about $229 and $275 respectively. Yet the value captured from these products through assembly in China is around $10. Statistical agencies are developing tools to gain a more accurate breakdown of the origins of traded goods by value added, which will be attributed based on the location of processing, not on the location of ownership. This will eventually provide a clearer picture of who our trading partners really are, but, while this lengthy process unfolds, countries will still be arguing based on misleading data. The procedure is simple. Place a CD or DVD inside the black box, secure the disc with the magnetic puck and rock the switch. The disc will start spinning and the light will flash 120 times in a 2-minute period. After that, the disc will stop spinning and voila, the disc is finalized. The flash applied is rated at 1000mW/sec, has a temperature of 5500K and light intensity of one million Lux. So in fact the disc is exposed to sunlight without destroying it. Every year we’ve seen the pattern of the iPhone topping the list in the fourth and first quarter of the year, while the Galaxy S tops the second and third quarter. This pattern now seems to have been broken as the iPhone 6 continues to top the list since September 2014. The highly anticipated Galaxy S6 Edge was plagued with supply issues in the first month and now suffers from its high price tag – quickly losing its flare as a consequence. We see its sales figures declining since its launch in April. This is a heavy blow to Samsung as it has no other new model launched in 2015 in the top 10 best sellers list. The list goes: iPhone 6, iPhone 6 Plus, Samsung GS6, Samsung GS6 Edge, iPhone 5S, Xiaomi Mi Note, Samsung Galaxy S5, Samsung Galaxy Note 4, Xiaomi Redmi 2, LG G4. (Relative sizes not given.) This is the first time LG has been in there this year; Xiaomi’s presence is a clear and present danger to Samsung. Note that the data is for sales to users, not shipments to carriers. Korean smartphone makers are expected to face a crisis after showing good performance in Latin America. Samsung Electronics accounted for 29.5% of the smartphone market in Latin America during Q1 2015, down 10% or more compared to the same period last year, according to Hong Kong-based market research firm Counterpoint Research. LG Electronics, which was the second-most-popular smartphone vendor in the region, also experienced a decline in market share within a year, from 14% to 10.9%. The combined share of the two Korean companies amounted to 52.4% in Q1 2014, but the figure for Q1 2015 was 40.4%. Therefore, it is urgent for two Android phone makers to come up with measures to address the problem. In contrast, a shift in the center of gravity for the global smartphone market is predicted to become a golden opportunity for Chinese firms that mainly produce entry-level and mid-range smartphones. Xiaomi recently entered the Brazilian mobile phone market by showcasing the Redmi2, a mid-range model, in line with the current market environment. The Chinese company decided to produce Android phones in Brazil for local consumption by asking Foxconn to assemble their products in the country. More concerning for them is that sales of smartphones in Latin America are slowing down – so that’s a falling share in a falling or static market. The attack tools [Charlie] Miller and [Chris] Valasek developed can remotely trigger more than the dashboard and transmission tricks they used against me on the highway. They demonstrated as much on the same day as my traumatic experience on I-40; After narrowly averting death by semi-trailer, I managed to roll the lame Jeep down an exit ramp, re-engaged the transmission by turning the ignition off and on, and found an empty lot where I could safely continue the experiment. Miller and Valasek’s full arsenal includes functions that at lower speeds fully kill the engine, abruptly engage the brakes, or disable them altogether. The most disturbing maneuver came when they cut the Jeep’s brakes, leaving me frantically pumping the pedal as the 2-ton SUV slid uncontrollably into a ditch. The researchers say they’re working on perfecting their steering control – for now they can only hijack the wheel when the Jeep is in reverse. All this is remote and wireless – they aren’t directly plugged in to the car: the car’s phone connection makes it vulnerable if you know its IP address. Let’s just hope these cars aren’t running Flash. For a few months, in slivers of spare time, I’ve been working on a little app for city bike navigation, called CityCyclist. I’ve tried to build something clean and accessible, that gets a good bike route on the screen as quickly as possible. That’s glanceable while on a bike, and more useful when off. Key innovations: there’s a little scrubber on the elevation profile at the bottom to fly quickly along a route without zooming and panning around. My hypothesis was that might make it easier to consign a route to memory. I suspect that’s not true, but I still like it. The search results use a combination of Foursquare and Apple’s address geocoder, and seem fairly good. The height detail is really nifty. And yes, cyclists have very different routing needs from drivers or walkers. This entry was posted in links and tagged apple, audio, cycling, failure, flash, google, hacking, iphone, korea, samsung by charlesarthur. Bookmark the permalink.